On 20th February 2014, Platform 7 played their most exciting gig to date, at London’s Bush Hall, teaming up with Police Dog Hogan. On Tuesday night Sounding Out band Platform 7 were invited to perform at a special event for the Social Business Trust, an organisation which supports social enterprises to grow. The band performed two twenty-minute sets to those assembled to celebrate the Social Business Trust’s achievements over the last year, on the ninth floor of number 1 More London, with spectacular views of the Thames. Not only did our current cohort of Making Tracks participants put on a brilliant show with five original songs written since Monday morning, but their tracks sandwiched a special set from Sounding Out graduate Adrian Harrison, aka Tru Star (aka Fudge) celebrating his BBC Performing Arts Fund fellowship. And what a celebration it was! As well as Adrian’s own fantastic material, on three songs he was joined by previous Making Tracks participants to perform songs he’s helped them to write/perform during his fellowship. Heritier, Chains (aka Shallise), Nirobi and Paradox (aka Terell) all truly shone. It was delight to see them again. A quick shout out too to Adrian’s backing band, who learned a lot of songs very quickly – Gary, Charles, Hermione (on bass!) and Sara (on drums!) smashed it. The Sounding Out band Platform 7 performed a full set as part of the marvellous Koestler Trust‘s 50th anniversary celebrations and 2012 Awards Exhibition ‘Free’ launch. 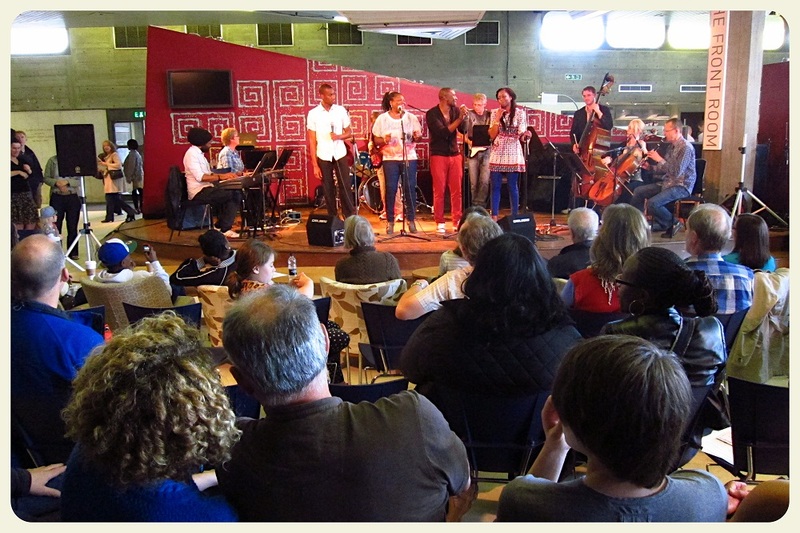 Sunday 15th July 2012, 12pm – Queen Elizabeth Hall Foyer, Southbank Centre, London. Platform 7 were invited to perform as part of an exciting weekend celebrating PRS for Music Foundation’s New Music 20×12 programme. This was a wonderful opportunity for the band to perform in a very public space, and they went down a storm. You can see more photos of the event courtesy of our favourite artistic collaborator Lizzie Coombes here. 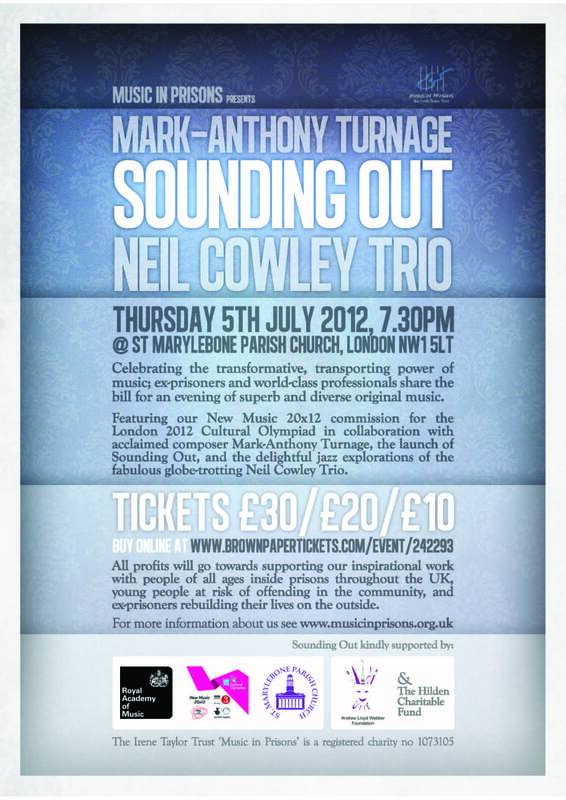 The debut performance of the Sounding Out band took place on Thursday 5th July 2012 at St Marylebone Parish Church. This very exciting evening provide a stunning showcase of The Irene Taylor Trust’s work, kicking off with a beautiful film of MiP’s collaboration ‘Beyond This’ with contemporary composer Mark-Anthony Turnage and men at HMP Lowdham Grange (introduced by Turnage) – a commission for PRS For Music Foundation’s New Music 20×12 programme as part of the London 2012 Cultural Olympiad celebrations. The Sounding Out band then took centre stage to unveil the original new music created over 5 days in June. They were accompanied by two students from The Royal Academy of Music, Hermione Jones on cello and Joe Bentley on double-bass, who provided a mini strings section to further enhance the storming set. The evening concluded with a very special guest set by the wonderful Neil Cowley Trio (featuring regular MiP project leader Rex on double-bass) just hours before they flew to Montreal to begin a world-hopping tour.